The star cluster NGC 6604 is shown in this image taken by the Wide Field Imager, which is attached to the 2.2-meter MPG/ESO telescope at the La Silla Observatory in Chile. A bright star cluster, set against a dazzling landscape of glowing gas and dust clouds inside a slithering constellation, takes center stage in an amazing new photo by a telescope in Chile. The cluster, called NGC 6604, is visible in the upper left portion of the image, which was taken by the European Southern Observatory's (ESO) Wide Field Imager on the MPG/ESO 2.2-meter telescope at the La Silla Observatory in Chile. 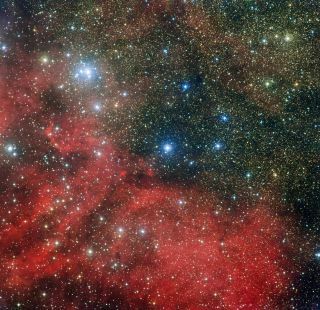 The young star cluster is the densest part of a more sprawling cosmic group that contains about 100 luminous blue-white stars, according to ESO officials. In the new picture, NGC 6604's associated nebula, called Sh2-54, is also visible. This stellar nursery is made up of glowing clouds of hydrogen gas and dust. The cluster's bright stars, which were first catalogued by British astronomer William Herschel in 1784, are easily identifiable in a small telescope. But the fainter cloud of gas was not clearly seen until it was catalogued by American astronomer Stewart Sharpless in the 1950s. The hot young stars in the NGC 6604 cluster are triggering the birth of a new generation of stars, astronomers said, by using their strong stellar wind and radiation to pull together gas and dust — the ingredients from which stars are born — into a compact region. These newborn stars will quickly replace their predecessors, because while bright, young stars are massive, they consume their fuel quickly and tend to live short lives, ESO officials explained. NGC 6604 is also an intriguing target for astronomers because it is releasing a strange column of hot ionized gas. Similar columns of hot gas, which emit material from young star clusters, have been detected elsewhere in the Milky Way and other spiral galaxies, but the relatively close proximity of NGC 6604 enables scientists to make better observations of the mysterious structure, ESO officials said. The column seen emanating from NGC 6604 is perpendicular to the galactic plane and measures a staggering 650 light-years in length, ESO officials said. Some astronomers have called this structure a "chimney," and early observations suggest that the cluster's hot stars are producing it, but more research is still needed to better understand what is happening within NGC 6604.